The new Agriculture NewsPortal of the FAO Regional Office for the Near East and North Africa (RNE) is now operational and available online in both English and Arabic for strengthening agriculture information dissemination and knowledge sharing in Near East and North Africa region. 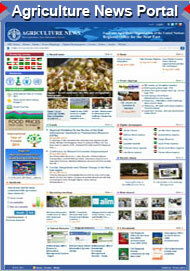 How do you rate the newly established RNE Agriculture News Portal? Please express your vote on the Agriculture News homepage!